Feed kitty in style with SAUCER. This luxurious cat food dish is from award-winning product designer Rebecca Finell of Finell Co. This is a wonderful example of Rebecca’s innovative combination of beautiful modern form and outstanding function. The wide shallow surface is perfect for cats to eat from and the weighted dish won’t slide while kitty dines. SAUCER is available in three sizes – small (4.75″), medium (7″) and large (9.5″), perfect for one, two or even three cats to eat together. Available exclusively from the Hauspanther online store for $30 (small), $50 (medium) or $70 (large) plus shipping. Earth Day Special! 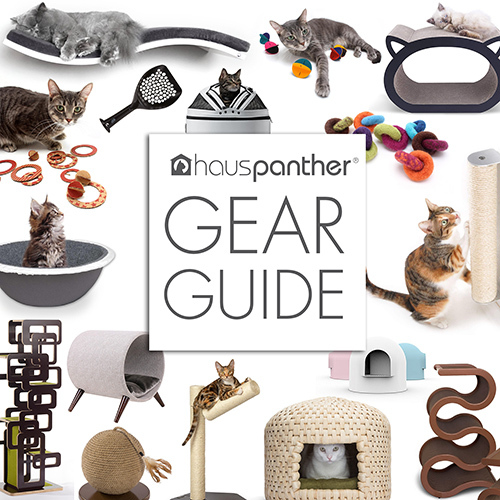 Big Savings on Cardboard Cat Toys from Hauspanther! Like plastic, silicone is questionable as a feeding vessel for cats or pets, in general. Both leach and hold bacteria in small crack or crevices. Best to stick with lead-free glazed stoneware or lead and radioactive free stainless steel. Glass is also a good option if you can find one that is not fragile and human safe. Hi, I think these dishes are pretty and that they’re dishwasher, microwave safe. Silicon means no odors either. I love that they’re slip proof because my boy has trouble keeping his dish in one spot so I MacGyvered it for him. I have 2 babies, and I have several dishes because I feed them 3x’s a day & don’t always have a chance to fully wash out the dishes before they have their next meal. (I prefer to sterilize them in between feedings). But I don’t think there is a way I can justify spending $30 on one dish, or can imagine $240 to replace the ones I have now. Wish I could see that, but I spend so much on their special diets that I already have such difficulty making ends meet. I’m sure they’re great, how could they not be. I love the tip-free shape! I’m wondering though, how pliable these silicone dishes are. If the edges are pliable, many of the kittens I foster would have the contents spilled in no time. It seems there is always at least one that enjoys standing on the edge of their bowls! They certainly do not appear to be very deep which would cause me to question them for a multi-cat situation. Like Angela, I am also concerned about silicone. I am not sure it is entirely safe, and would like more information about that. Still, I like the idea. Love the colors, size choices, and purported safety; but I agree with Joy that the prices are prohibitive, especially for those o of us with multicat families. Cute but as others have stated, prohibitively expensive. For the price of one of these bowls, I could TNR one female cat & prevent hundreds of unwanted kittens being born.